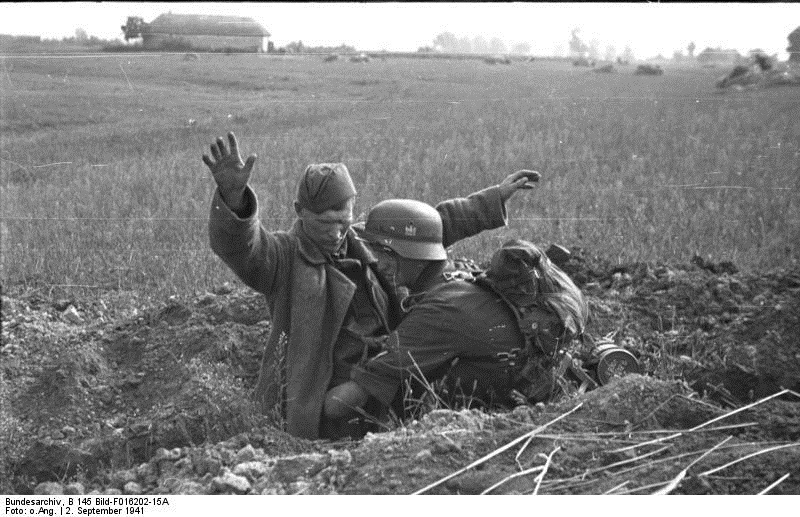 After crossing the Dneipr River, a German soldier searches a surrendering Soviet soldier in his foxhole on 2 September 1941. This area near the river is very marshy and it is relatively easy to dig holes there. (Federal Archive B 145 Bild-F016202-15A). 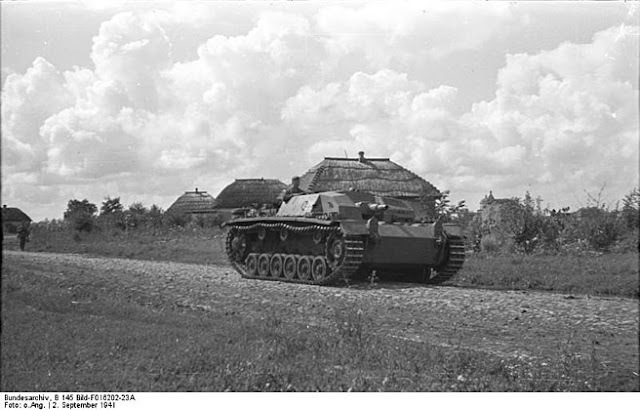 Eastern Front: The German advance is at a standstill on 2 September 1941 due to a variety of factors. 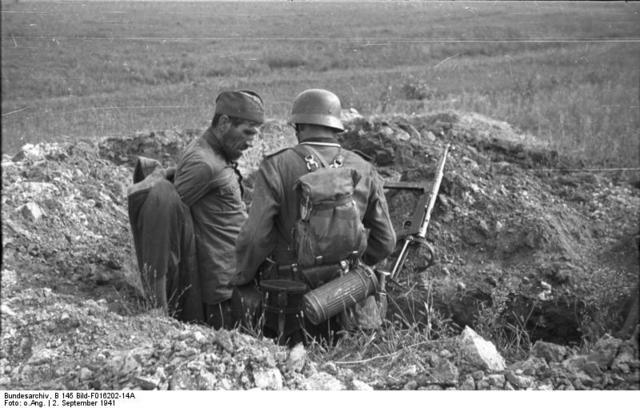 In some places, Soviet counterattacks are forcing many leading German elements to guard their flanks, while in others the Wehrmacht is simply consolidating past advances. There are some German gains, but they are local. 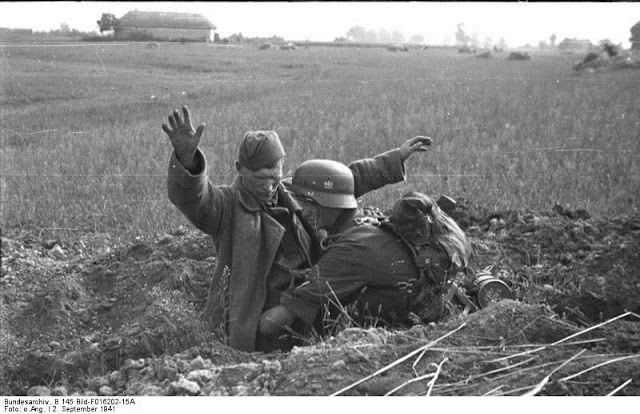 In fact, there is a very rare occurrence to this point in the war, with the Germans deciding that they have to withdraw in the central sector due to Soviet pressure. 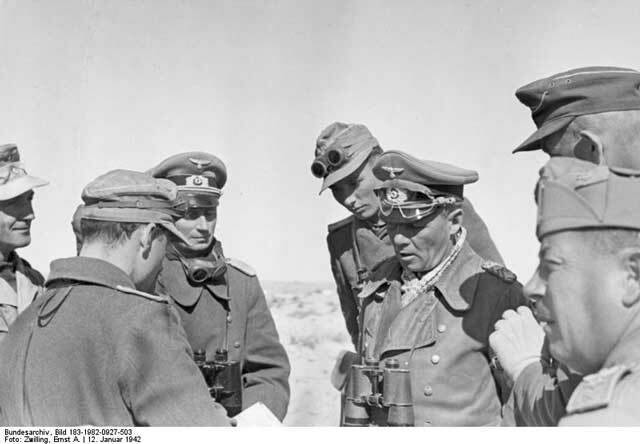 OKH Chief of Staff General Franz Halder bemoans the "absence of any purposeful concentration of strength" at several points along the front. It is a growing problem for the Germans, not so much because of poor generalship as the growing spaces that need to be defended. Perhaps the most notable aspect of this conference in light of later events is that the decision to withdraw apparently is made without resistance from Hitler, who does, however, ask several pointed questions about why this situation developed when he is informed. In his war diary, Halder treats Hitler's concerns as just an annoyance to be dealt with by others. Finnish troops crossing Rajajoki River, 2 September 1941 (SA-Kuva). 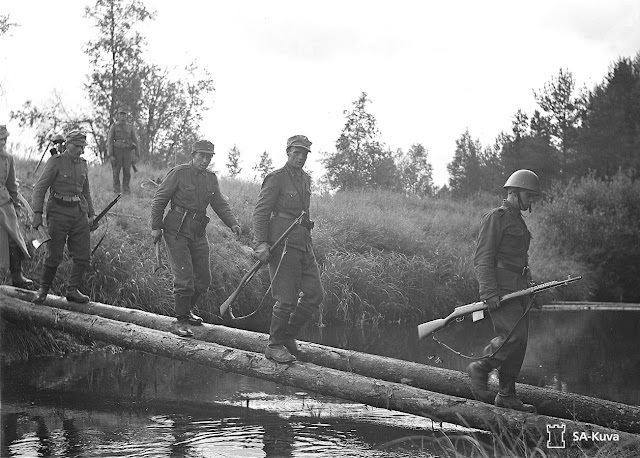 In the Far North sector, Finnish troops reach the pre-1939 border on the Karelian Isthmus. 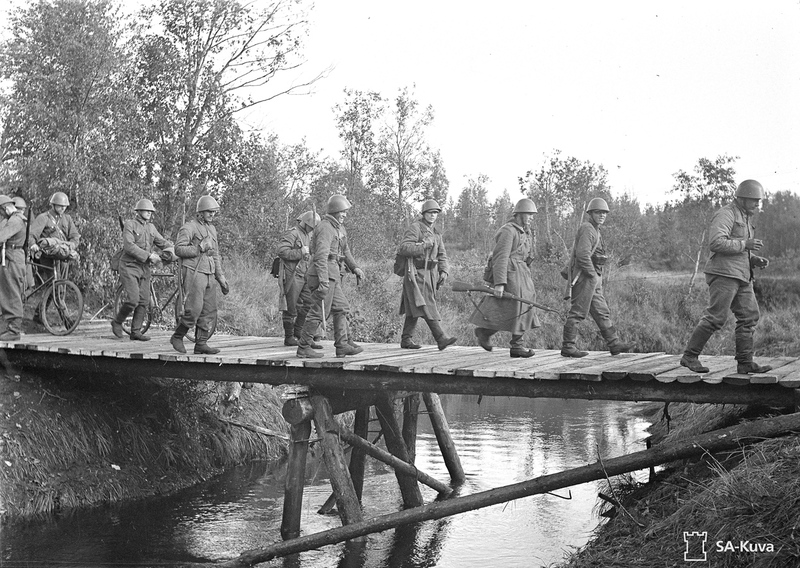 Contrary to some past incidents, the Finnish troops cross the border without any hesitation. 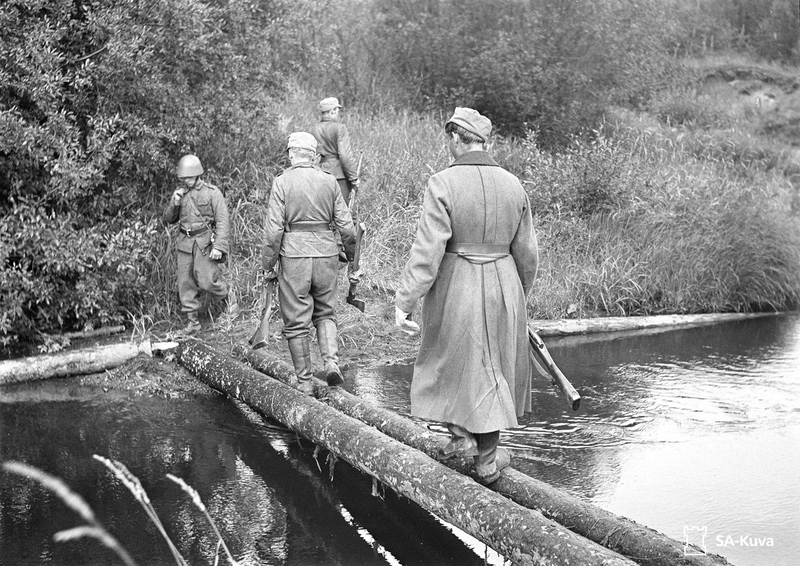 Marshal Mannerheim orders the troops to advance until they have reached the shortest possible defensive line across the isthmus, which is beyond the old border but still well short of Leningrad. 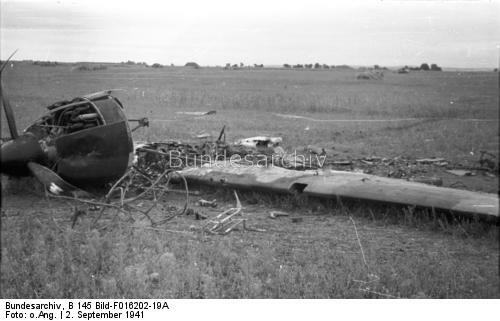 Crashed airplane to the east of the Dneipr River, 2 September 1941 (Federal Archive B 145 Fig. F016202-19A). In the Army Group North sector, advances are minor. Halder criticizes Army Group Commander von Leeb, who he says (but not by name) "shies from taking risks and so pushes on only by inches." About 20 miles south of Leningrad, advance Wehrmacht troops try to push through determined Soviet opposition. Soviet gunboats on the Neva River support the defenders. At the key railway junction of Mga somewhat to the southwest, the Germans finally end Soviet counterattacks and consolidate their hold on the town. While not of much use to the Germans, Mga's loss ends any hope of the Soviets reestablishing the rail line from Moscow to Leningrad. There is a secondary rail line further north that is still in Soviet hands, but it is threatened, too. In the Army Group Center sector, General Halder holds a difficult conference with Army Commander Field Marshal von Brauchitsch and Army Group Center commander Field Marshal von Bock. After reviewing the heavy casualties and lack of reserves in the Yelnya "lightning rod" position, they decide to evacuate the salient. In retrospect, some consider the first time that the Germans have been forced to make a significant retreat during World War II. The situation is made more critical by the need to transfer all available reserves to support General Guderian's Panzer Group 2 and accompanying Second Army, which are facing heavy counterattacks south of the Desna. Guderian's tanks give up some ground on the east flank when they are supposed to be advancing south toward Chernigov on the road to Kiev. In the Army Group South sector, the Germans are consolidating their bridgeheads across the Dneipr and make no further major progress. German Sixth Army begins attacking Soviet 37th Army as it continues plowing into the Kiev defenses. 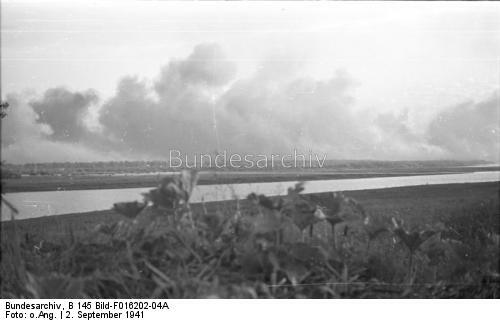 View across the Dneipr River, 2 September 1941 (Federal Archive B 145 Bild-F016202-04A). European Air Operations: The RAF has a rough night. It flies 201 sorties and loses 12 bombers. This is a 6% loss rate. This kind of attrition means that any airman who flies the required 20 such missions statistically is unlikely to return to base at some point. The RAF begins a daylight bombing campaign against targets in northern France. RAF Fighter Command sends six Blenheims on a sweep across the French coastline north to Ostend on Roadstead operations, losing one Blenheim bomber. They claim to set one ship on fire. RAF Bomber Command sends three Flying Fortresses to attack Bremen, Duisburg, and Hamburg, but only Bremen is attacked. After dark, the RAF attacks Frankfurt with 126 bombers (71 Wellingtons, 44 Whitleys, and 11 Hampdens). Three Wellings and a Hampden fail to return. Damage is slight. A secondary attack by 49 bombers (32 Hampdens, 7 Halifaxes, 6 Stirlings, and 4 Manchester bombers) bombs Berlin. The RAF loses five bombers (2 Halifaxes, 2 Hampdens, and a Manchester). There are also 16 RAF bombers sent to lay mines off the Frisian Islands and Danish coast. There are ten Wellingtons and Whitleys sent to bomb Ostend. The RAF loses two Hampdens and 1 Wellington. In the Berlin raid, RAF No. 61 Wing Commander G.E. Valentine and Group Captain J.F. Barrett are killed. They are buried in the Berlin War Cemetery. A Sturmgeschütz III advances after crossing the Dneipr, 2 September 1941 (Federal Archive B 145 Fig. F016202-23A). Battle of the Baltic: Finnish Thornycroft boat Syöksy sinks Soviet transport Meero south of Koivisto in Koivisto Sound. Finnish minelayers conduct operations designed to bottle up the Soviet warships at Kronstadt and Leningrad. Battle of the Atlantic: Royal Navy Force M, composed of aircraft carrier HMS Victorious, heavy cruisers Devonshire and Suffolk, and six destroyers, departs from Sardam Bay on Operation EGV1. This is a planned attack on German convoys and installations at Tromso in northern Norway. The 4989-ton German freighter Oslebshausen sinks near Obrestad, Norway (near Stavanger). This apparently is due to a mine, though some sources say it is due to RAF torpedo attack. Norwegian sources report that renovated 1866 fishing vessel Sydnes springs a leak and sinks under tow after taking on coal at Kristiansund. German salvage tug Peter Wessels hits a mine and sinks in the Ems River. Royal Navy landing craft HMS LCP(L) 59 and LCP(L) 71 sink on this date. No other details are readily available. Free French destroyer La Cordeliere runs aground in Scotland and sustains some minor damage. Convoy OS 5 departs from Liverpool bound for Freetown, Convoy HG 72 departs from Gibraltar bound for Liverpool, Convoy ST 2 departs from Freetown bound for Takoradi. Royal Navy submarine HMS Umbra is commissioned. Canadian corvette HMCS Fredericton (Quebec), patrol boat Ehkoli (British Columbia), and minesweeper Miramichi (North Vancouver) are launched. USS submarine US Gurnard is laid down. 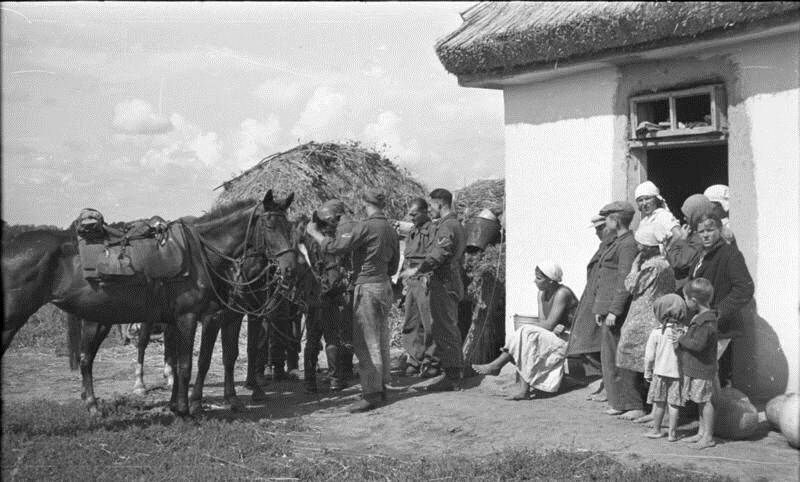 After crossing the Dneipr, German soldiers aid an injured rider, 2 September 1941 (Federal Archive B 145 Image-F016202-24A). Battle of the Mediterranean: Royal Navy submarines HMS Ursula and Triumph arrive at Malta after completing patrols to the south. Malta has just concluded its first full week without any enemy night air raids since early in the war. The moon, however, is now full, and before dawn, there is a lengthy raid that lasts for four or five hours. Damage is minor. There are no raids during the day or after dark. A mine explodes at Ta Qali, killing three or four RAF soldiers. Battle of the Black Sea: Soviet cruisers Chervona Ukraina and Komintern support the ground troops at Odessa. Partisans: Marshal Tito's forces combine with the nationalist Chetniks in attacks on the German garrison in Krupanj in Serbia. Special Operations: In Spitzbergen, Royal Navy transport Empress of Canada embarks the inhabitants and Canadian troops. Before they depart, the Canadians destroy the town after already having destroyed the nearby coal facilities. The force, which includes cruisers and destroyers, plans to leave on 3 September. The Germans remain completely unaware of the operation. 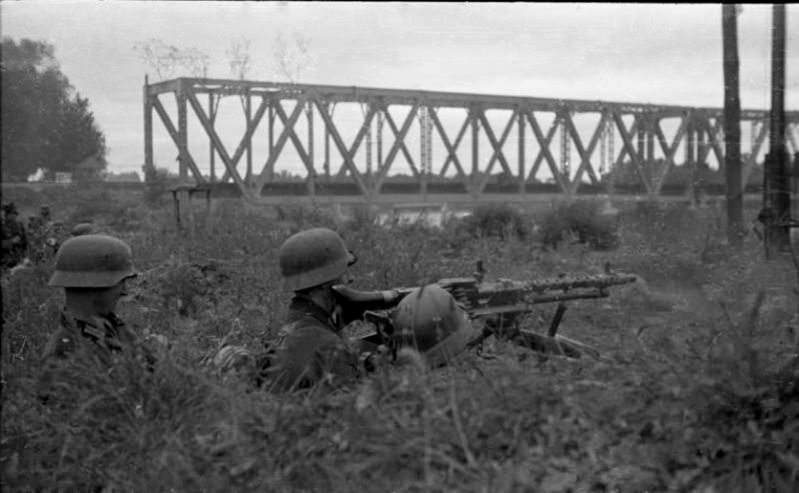 A German machine-gun squad mans an MG-34 at a railway bridge across the Dneipr, 2 September 1941 (Federal Archive B 145 Bild-F016205-06). Spy Stuff: Finally realizing that its codes are compromised, the Red Army discontinues use of its "five number code." Many communications in the first few days of the invasion were uncoded voice transmissions or over ordinary telephone lines, and the Red Army continues to have difficulties keeping its transmissions secret. The Finns, in particular, have had great success in breaking the Soviet codes, but this destroys that advantage. Throughout World War II, code-breaking will play a major role in operations. conditioned by our military invasion of French Indo-China, it was a fact that the government of these islands had drastically stepped up their anti-Japanese tendencies and very evidently assumed an attitude of aid to China. Trade continues between the Netherlands East Indies, however. US/Mexican Relations: The United States extends loans to Mexico to create a joint defense of the hemisphere. In addition, the two countries, and also Colombia and Ecuador, enter into currency stabilization agreements. 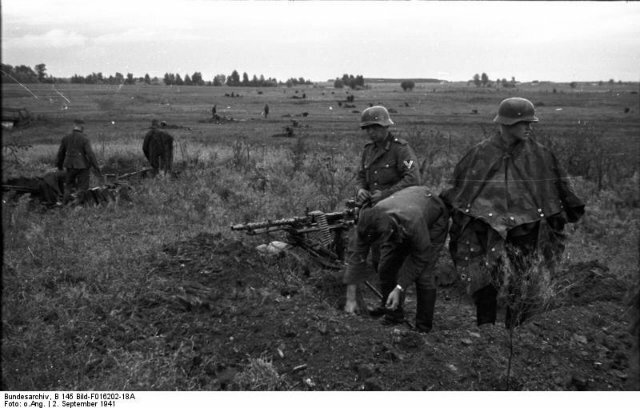 German soldiers search Soviet machine-gun foxholes after crossing the Dneipr on 2 September 1941 (Federal Archive B 145 Bild-F016202-18A). Japanese Military: The Imperial Japanese Air Force establishes the Air Defense Bureau in order to centralize air defenses throughout Japan. United States Military: There is no sense of urgency on the American side in the Pacific. General Douglas MacArthur, in charge of US forces in the Philippines, casually remarks to Admiral Hart that there is "plenty of time" to get ready for a Japanese attack. British Military: Royal Navy sailor Albert Howarth is awarded the Albert Medal after saving the life of another man in the water after his own foot had been blown off. Soviet Prisoners being taken prisoner after German troops cross the Dneipr, 2 September 1941 (Federal Archive B 145 Fig. F016202-14A). Soviet Military: The Soviet 54th Army forms in the Leningrad sector. US Government: Edward Stettinius replaces Roosevelt crony Harry Hopkins as Lend-Lease administrator. China: The collaborationist government of Manchuria ("Wei Manzhouguo") enacts its second five-year plan for economic growth. Holocaust: German police operate in conjunction with local auxiliaries to massacre over 3700 Jews at Ponary (near Vilnius) in the Ponary massacre. Soviet Homefront: About 300 Soviet trains are en route to the Urals carrying the machine tools of 90 factories that were threatened by the German advance. Leningrad is isolated. In addition to a population of 2.5 million inhabitants, about 100,000 refugees have poured into the city. There is not enough food in the city to feed everyone. The loss of the main rail line through Mga means food deliveries from the south are going to have to travel by other means, none of which are adequate. Leningrad officials impose food rationing. Italian Homefront: Il Popolo d’Italia, the fascist newspaper, writes that the goal of the Hitler/Mussolini alliance is to form a united Europe through the "‘harmonious co-operation of all European peoples." American Homefront: "The Great Gildersleeve" radio program debuts on NBC. It is a spinoff of "Fibber McGee and Molly." It quickly becomes very popular and lasts throughout the decade. Future History: John Thompson is born in Washington, D.C. He becomes the legendary basketball coach of the Georgetown Hoyas. In 1984, Thompson becomes the first African-American head coach to win a major collegiate championship. He is the head coach who grooms Patrick Ewing, the center on the team, into becoming a dominant force in the NBA. As of this writing, John Thompson is a professional radio and television sports commentator.